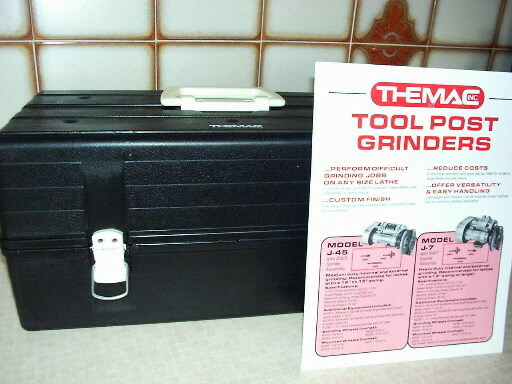 In the USA, the Themac corporation recognised the demand for a small but powerful grinding attachment to fit to the tool-post of a lathe and provide versatile precision grinding facilities for the workshop at a fraction of the cost of buying a dedicated grinder. 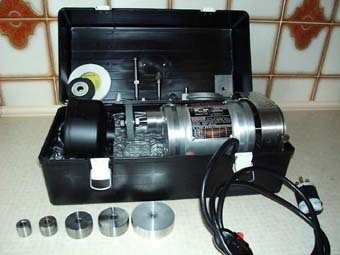 They developed a range of belt driven units, where the spindle speed can be geared up and down from the 10,000 RPM of the motor, and which have several clever features which make them the ultimate in quick set-up engineering. Now you can benefit from this technology in the UK too. The best seller is the ½ horsepower J45 unit, which can be provided in 110V or 220V versions. The unit comes with a comprehensive selection of pulleys, three wheel mounting spindles, a selection of SiC and Aloxite internal and external wheels, a diamond wheel dressing unit and of course a wheel and belt guard system. It all fits into a purpose made carry/storage box and weighs just 12 Kg. We use a J45 all the time, usually with diamond grinding wheels, since we are grinding hard materials like ceramics and tungsten carbide. Its sealed spindle bearings have given no trouble in 3 years of regular use, and with practice it takes us just a few minutes to set up most of the jobs we do, from cutting off, facing, internal or external plunge grinding and chamfering. 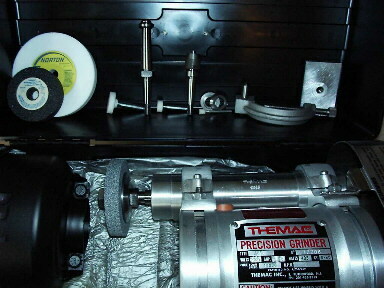 Our small lathe doesn't have good traverse facilities or a high stiffness, so we don't use the grinder much for traverse cut external or internal work, but with a better lathe under the Themac unit, it would be fine. The grinding operations can be wet or dry according to the job, but some care has to be taken with wet use since the electric motor is not far away from the spray and splash producing wheel-head. It really is like having a "Subcontract Grinder" in a box under the bench!